EPROMs needed: 27C256 x6 (200 or less speed. 150 recommended). Be sure they are erased or erase them using an UV Eprom eraser (40 min.). Using Flash ROMs is the same but you need 29C256' 32kx8 ATMEL (28pin) FLASH ROMS instead of 27C256 ones. This options is better because flash roms are newer technology. Using Flash ROMs is the same but you need '29F010' 128k x 8 FLASH ROMS instead of 27C010 ones. This option is better because EEPROMS are newer than EPROMS. I will start writting what we have done in a .doc and upload it here so we can work on it. I was thinking about writing 2 of them: one for Atari STfm and Mega St and another for a STe and a Mega STe following more or less the index I proposed. Atari TT and Falcon can be later works. EEPROMs needed,hardware mod (switch) or can be by a prg in a floppy disk that ables you to change TOS? This is all interesting stuff. I recently took it upon myself to source and digest information on the net about TOS v2.06 burning, and Atari ST ROM burning in general. There seems to be little Information about compatibility and hardware modification requirements of TOS v2.06 ROMS and v1.62 ROMS for an Atari STFM system - how is it possible to get these ROMS to work on an Atari STFM? Have you visited this url:? Or are they lurking somewhere? Maybe of some help for people. I have got a few EPROM to STFM boards coming this week if anyone wants one they are in my store. I have not got many made as I only really needed a couple myself and no interest from anyone else. Hi! 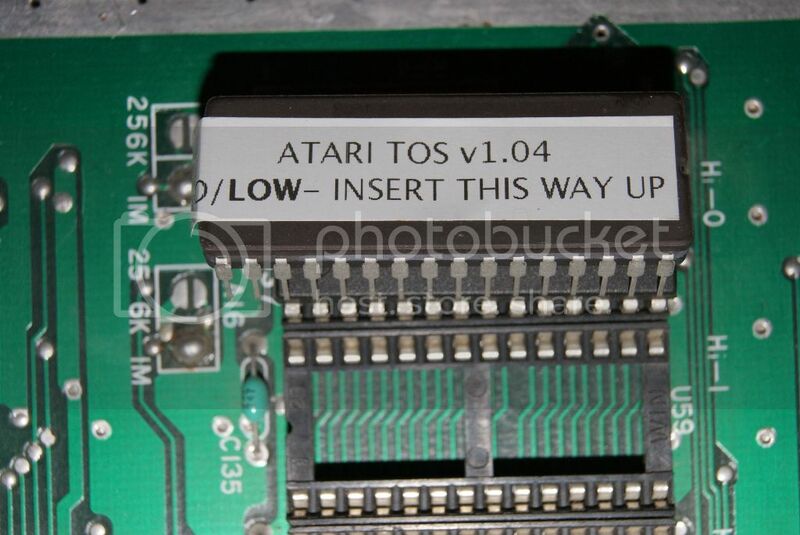 i have an Atari 1040STfm with TOS 1.02. My motherboard has 6 sockets for 28 pins chips, but only 2 chips by SHARP. 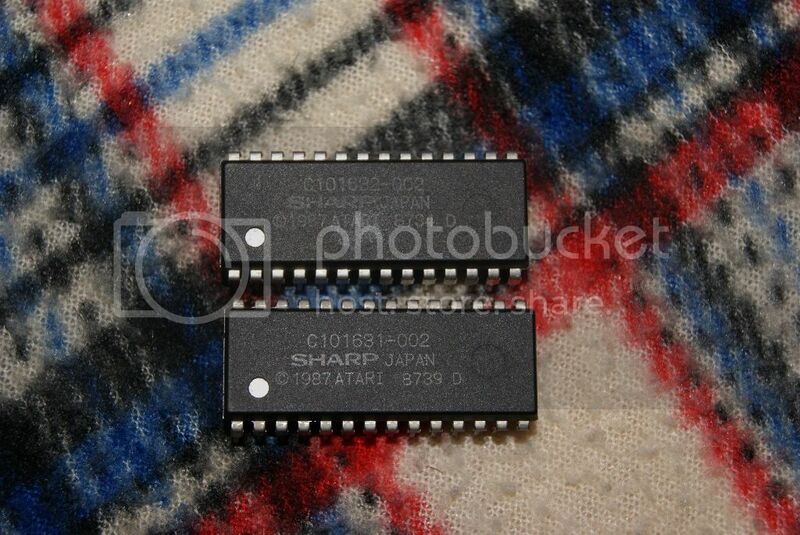 I bought from Ebay UK 2 chips eproms 32pins with TOS 1.04, what i can do to fit them on my Atari? i think that i must do this that exxos told! this is the same as exxos site? i mean cable connections on eproms. http://www.adsb.co.uk/bbc/adaptor.html and some photos from mine ST. I do have some pcbs in my store to adapt the EPROM to 2 chip TOS set. I plan to build some up this week as I have not yet had chance to test them. I should have pcb only in the store next week. 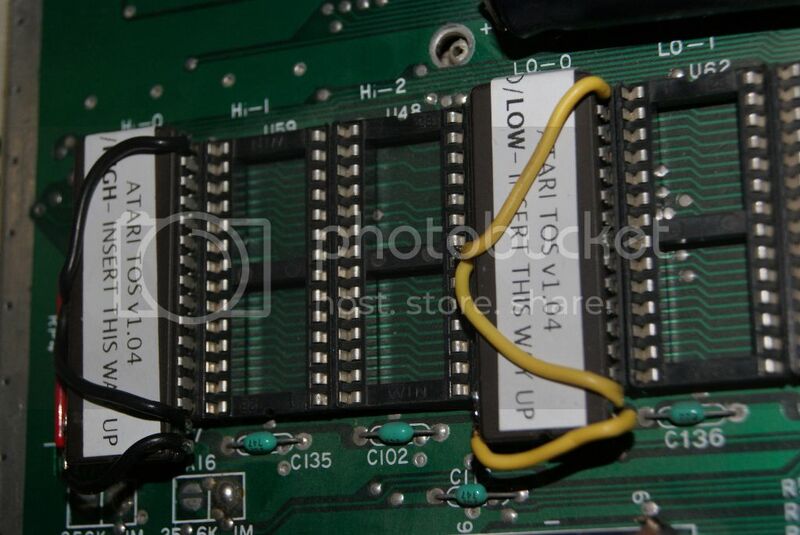 i want to buy some eproms sockets with 32pins. one thing to note here, you have to fit the eproms direct into the sockets (hardware only) otherwise the ST metalwork will not sit flush, and this could prevent you from screwing the case back together and even cause the keyboard to be at the wrong angle. Note the metalwork rests directly ontop of the first TOS chip towards the edge of the board. So any additional sockets or such will cause a problem. While my TOS adapter PCB is a simple plugin, you will not be able to reassemble back into the ST case. So doing the wiring direct on the chip as I show on my pages is the only other "easy" solution. ok! thank you for your answer! Ready at last! working perfectly! Congratulations, and thanks for the pics. I really like the "this way up" part. Thank you! all games and programs i have tried works ok with TOS 1.04! DarkLord wrote: I really like the "this way up" part. There's no two ways about it, no ? I have an Atari STe with spanish TOS 1.62. This version can't be found on internet (I haven't found it). If anyone is interested, I can send the .bin files (I do not know how to merge them to make it work on hatari or steem). please could you send me the files. I will merge them to the img. Last edited by qq1975b on Mon Apr 01, 2013 5:52 pm, edited 4 times in total. exxos wrote: one thing to note here, you have to fit the eproms direct into the sockets (hardware only) otherwise the ST metalwork will not sit flush, and this could prevent you from screwing the case back together and even cause the keyboard to be at the wrong angle. Note the metalwork rests directly ontop of the first TOS chip towards the edge of the board. So any additional sockets or such will cause a problem. While my TOS adapter PCB is a simple plugin, you will not be able to reassemble back into the ST case. So doing the wiring direct on the chip as I show on my pages is the only other "easy" solution. 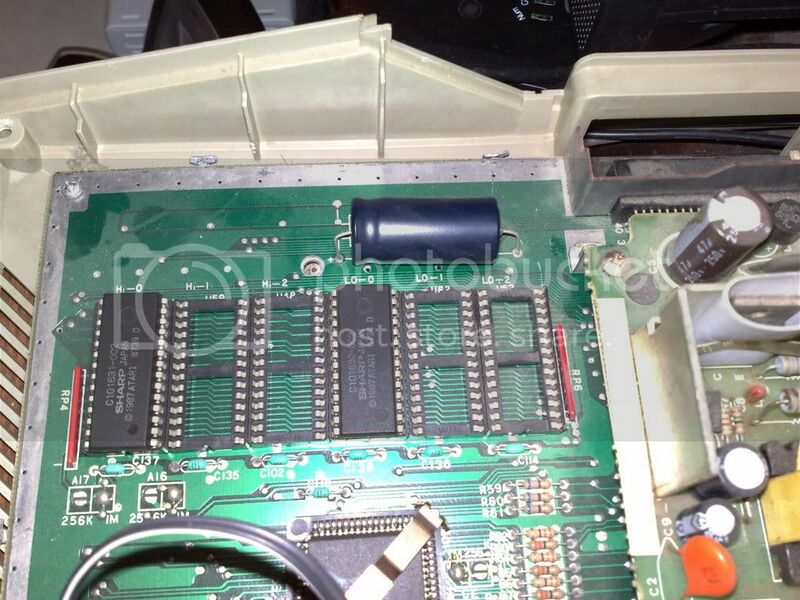 So, if I have an Atari Mega 4 with german 1.4 TOS and I want to replace it for an spanish 1.4 TOS I have to do this soldering stuff, is that right? isn't there any 28 pin compatible EPROM that can handle this update? About the rom image... Do I have only to split the 1.4 spanish TOS .img file into two files? like with the 1.62 TOS? Last edited by qq1975b on Fri Mar 29, 2013 7:58 pm, edited 1 time in total. It will only be possible through adapters or making that soldering bridges...is that right? 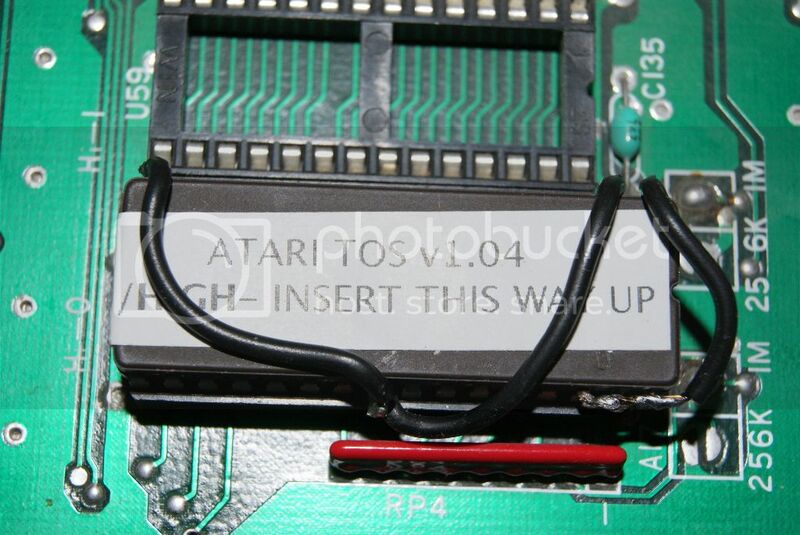 By the way...does anybody know where I can find (if it exists) the Atari TOS 2.06 and 3.06 Spanish? EDIT: 1.62 spanish TOS uploaded again in a previous post with the PAL patched version. By the way...is there a more or less simple way to translate a TOS rom? I mean, I have TOS 3.05 spanish...but there isn't a 3.06 one. Can I get the UK 3.06 and translate it to Spanish using 3.05 spanish rom code? NikiforosST wrote: Ready at last! working perfectly! I have tried to do it for my Mega 4 but I only achieve a white screen with slightly yellow borders. TOS 1.04SP burnt in 2 27C010 EPROMS. The original TOS .IMG file had been splitted in two files (HI and LO) using Hatari and Ppera ROMSPLIT. But it doesn't work....What I have done wrong??? Is the 27C010 Ok for this update or I need the 27C1000 ones? Yes, 27C010 are fine, but there are no 28pin 1MBit EPROMs, just PROMS (Atari) as the EPROMs need more pins for programming purposes. Like 12.5V programming voltage. 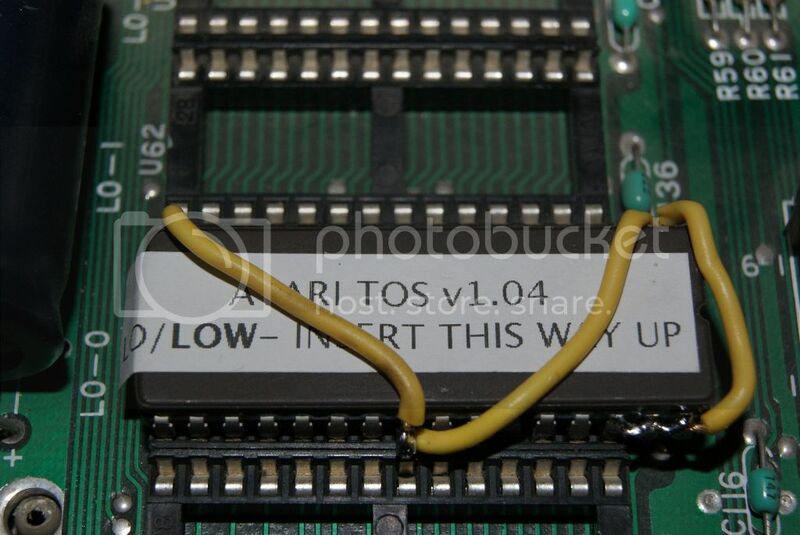 If you want to put a TOS1.04 into two 32pin EPROMs you will need some kind of PCB adaptor. Take the schematics of your Mega ST and the datasheet of a 27C010. Compare the pinout. Either you design your own PCB or you may use wiring.